The ALM Octane lifecycle can include the stages described below. ALM Octane is flexible. You can perform some of the stages at any point. For example, you can define your backlog before you create requirements. On the other hand, some stages must precede other stages. For example, you must define manual tests or automated tests and execute them before you can track quality. The following diagram describes a typical flow. You actual flow is determined by your organization's preference. Depending on your development methodology, you can create high-level requirements, or build a detailed backlog tree with epics, features, and stories. Create tests to track release quality, including functional, sanity, acceptance, security, and performance tests. You can also integrate with a CI server to get results of automated tests. As you implement user stories, you can report defects and monitor their progress. When you run manual tests and CI server pipelines, results are automatically incorporated into the dashboard. You can then use the dashboard to analyze release quality. For details, see Backlog management. To track build quality and collect automated test run results, integrate ALM Octane with a CI server. When the pipelines run, ALM Octane collects test run results and SCM data. This information can be used to analyze build, release, and product quality. You can view CI server pipeline steps graphically, trigger pipeline runs, and label pipeline steps as different types of jobs configured for different environments. The pipeline display lets you see the status of builds and test runs that are included in the pipeline run, and to analyze failures. For details, see CI Pipelines. After a release goes out, integrate the testing of individual new features into the testing of the overall product. In the release backlog, assign features and defects to application modules, which represent the functional parts of your product. You can also incorporate manual and automated tests into the testing of the overall product, and assign tests to application modules. For details, see Assign items to application modules. In ALM Octane, you group the functional areas of your product according to application modules. To build an application module tree, create nodes for each area that is essential for testing the overall quality of your product. Connect tests to the application modules. When you run tests and CI server pipelines, results are incorporated into the dashboard. You can then use the dashboard to analyze overall product quality. For details, see Quality management. 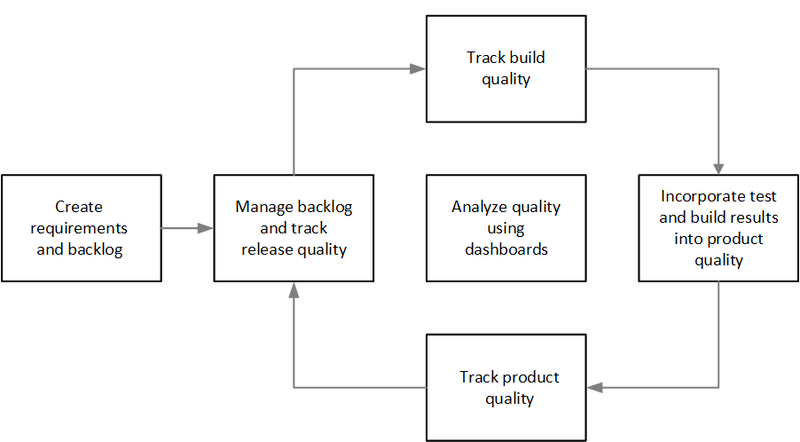 Throughout your release lifecycle you continue to track release quality, build quality, and product quality, as described above. You can analyze release progress and quality using the Overview tab, in both the Backlog and Quality modules. You can also analyze product quality within and across releases using the ALM Octane dashboard, which includes a wide range of useful charts and graphs. For details, see Use the ALM Octane Dashboard.